Congress today did an extraordinary flip-flop over party vice president Rahul Gandhi’s meeting with Chinese Ambassador to India Luo Zhaohui amid the ongoing standoff between India and China. A wanting to be ‘Bhakt’ channel will not question 3 Union Ministers visiting China or PM’s bonhomie & praise at G20 yet run fake news! 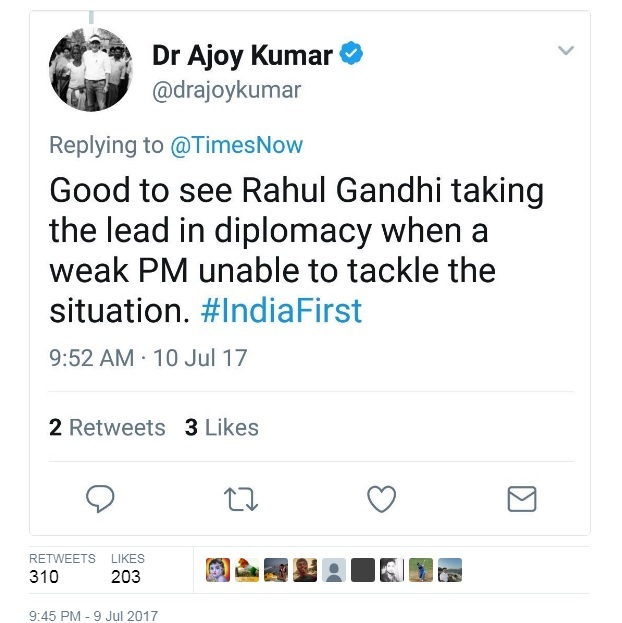 However, things were muddled when Dr Ajoy Kumar, another spokesperson of the Congress, replied to a Times Now tweet on Rahul Gandhi-Luo Zhaohui meeting, which suggested that the meeting indeed took place. However, he deleted the tweet, possibly as the official Congress line was to deny any meeting. But the party was caught lying as the Chinese embassy website had issued an official statement confirming the meeting between the Congress vice president and the Chinese envoy. The statement on the Chinese embassy website that was later removed. This led people to speculate even more as to why both the Congress party and China were trying to hide the meeting, after inadvertently having admitted the same. 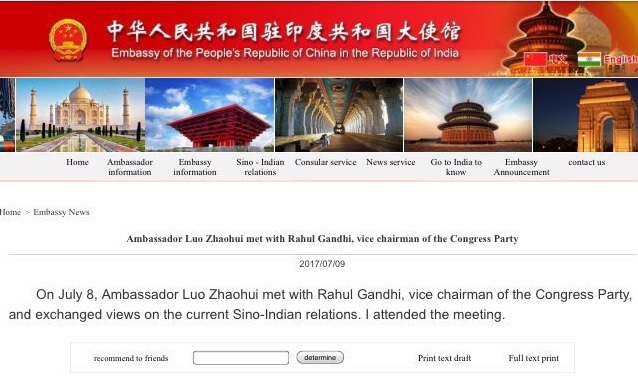 With the screensort of the official statement of China on Rahul Gandhi-Luo Zhaohui meeting went viral on social media, Congress made a u-turn accepting that Rahul Gandhi indeed met Luo Zhaohui. If it indeed was a normal meeting, why did Congress initially call it a “fake news” and even the Chinese embassy removed the statement from its website? Was Congress party working with China to hide the news about the meeting? If so, what and why is Congress trying to hide? The party had not clarified on such issues by the time this report was filed.